His whole life, he has been mistreated by the Germans. Daniel is a 14 year old Jew during the Holocaust. Him and his family are now on a train with thousands of other Jews to who knows where. All Daniel has left of his previous 14 years is a photo album. 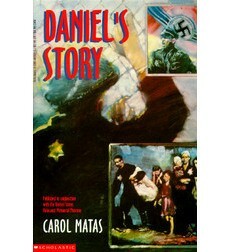 Looking back to the photo album, Daniel realizes that all of this time, the Germans treated him worse as time went on. He never thought that it would get this bad. Daniel was bullied by his teacher then was eventually forced to leave his own school and had to go to a Jewish school. Slowly, Daniel's family gets smaller and smaller. Losing his cousins, aunts, uncles, and grandparents. Luckily, Daniel's mom, dad, and sister were still not taken by the Nazis but, they were not being accepted into any other countries. Well, the whole family was caught and now that brings us to the train. Who knows whats in store for Daniel and his family. Will they live to see another day? Some of the ghettos had their own hospitals and police departments. The Nazis would shoot and kill the Jews for doing anything that they didn't like. Jews that couldn't work were put into machines and made into soap and lamps. Pretty much anybody that enjoys reading Holocaust books would enjoy this book. Teenagers would especially like this book because Daniel is a teenager and I think that it is nice to put into perspective of what kids used to have to live through.